The Morson Hinkley Skills Survey explores the importance of flexible workers in infrastructure. Based on the opinions of more than 2,500 independent flexible workers from across the UK, the Hinkley Point C Skills Survey provides a real insight into how to tackle the skills gap, why contracting is an increasingly popular working choice, how to encourage more diversity in engineering and what holds a flexible worker back from spreading their wings and seeking new opportunities in different sectors. In particular, this whitepaper draws attention to what factors attract flexible workers to a role and if they would consider relocating for work. This is especially pertinent with many major infrastructure projects, which require specific levels of locally-sourced skills. Flexible workers are best known for providing specialist skills to help deliver the UK’s largest and best-known infrastructure projects. The Government is backing a number of exciting programmes including Hinkley Point C, HS2, airport expansions and a million more homes by 2020, as well as talk of an even larger pipeline. Flexible workers are now viewed as ‘talent on demand’ to help top up skill gaps. In construction and engineering alone, the UK needs 400,000 new personnel by 2020. The skills shortage is at its highest in 20 years and questions are being raised as to whether we have the right technical abilities and capacity to fill the thousands of jobs that will be created over the coming years. 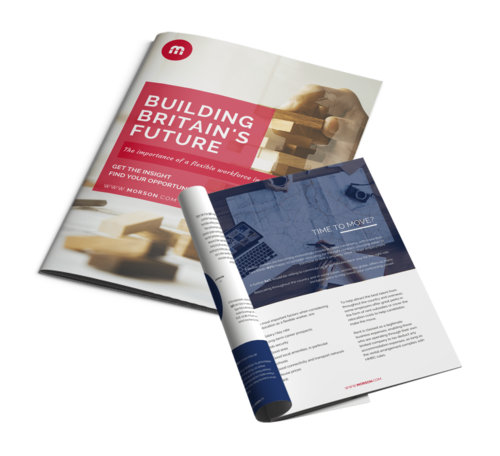 The renaissance in nuclear and new build programmes, in particular, presents exciting opportunities for Morson International, one of the UK’s leading manpower service companies. The Hinkley Point C project alone is expected to create around 25,000 job opportunities. Actively recruiting in these sectors ensures that we are well-placed to deliver the skills needed. Remaining ahead of the curve is crucial during projects of this scale, especially when the last nuclear new build of this kind completed in the late 1980s, and is why the recruiter is already looking at what technical abilities will be needed and what labour will be needed from overseas.